A total lunar eclipse will rise on April 4, 2015, but totality will only last for a very short amount of time. Only the speediest of skywatchers will have a chance to see the total lunar eclipse rising Saturday: NASA predicts that the total phase of the lunar eclipse will only last about 5 minutes, making it the shortest lunar eclipse of the century. Early-rising observers all over the United States should be able to see at least the partial phases of the April 4 lunar eclipse just before the sun rises, if weather permits. People on the West Coast will have the chance to see the moon turn an eerie shade of red during totality, which should begin at about 7:58 a.m. EDT (1158 GMT, 4:58 a.m. PDT). NASA this week unveiled a video detailing the total lunar eclipse, and dubbed the event the shortest lunar eclipse of the century in an announcement on Monday (March 30) in detail. 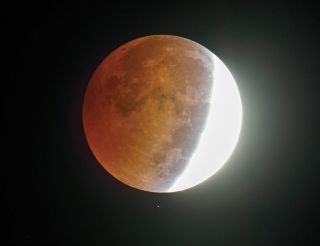 "Total lunar eclipses, like the one we're looking forward to on 4 April, are a slow, ethereal affair and, as usual, we'll have cameras around the world bringing us live views," Will Gater, an astronomer at the online Slooh Community Observatory said in a statement. "What better way to start the day than tuning in to watch this wonderful event." Slooh will host a live webcast of the total lunar eclipse on the Slooh.com website on Saturday starting at 6 a.m. EDT (1000 GMT) on April 4. The webcast will be available on Space.com, courtesy of Slooh. This lunar eclipse will be the third of four eclipses in a lunar eclipse tetrad. The first occurred in April 2014, with the second rising in September 2014. The final lunar eclipse in the tetrad will happen on Sept. 28, according to NASA. This sky map shows around the world will see the total lunar eclipse on April 4, 2015. Lunar eclipses occur when the moon dips into Earth's shadow, casting an occasionally spooky glow on the natural satellite. A partial phase of an eclipse happens when the moon passes through the outer part of Earth's shadow, but total lunar eclipses happen only when the darkest part of the planet's shadow falls across the lunar surface. "During the eclipse, the moon often looks reddish because sunlight has passed through Earth's atmosphere, which filters out most of its blue light," NASA officials said in a statement. "This eerie, harmless effect has earned the tongue-in-cheek nickname 'blood moon.'" Unlike total solar eclipses, lunar eclipses can be seen by anyone on Earth that can see the moon at the time of the eclipse, Sky & Telescope added. Total Solar eclipses — like the one that happened only a couple weeks ago, on March 20 — can usually only be seen by a small swath of the planet because of the way the moon, sun and Earth align. If you have any questions about the eclipse, you can ask a NASA astronomer via Twitter on Saturday using the hashtag #eclipse2015 starting at 6 a.m. EDT and lasting through the end of the eclipse at about 8 a.m. EDT (1200 GMT). Editor's Note: If you snap an amazing picture of the lunar eclipse Saturday or any other night sky view that you'd like to share for a possible story or image gallery, send photos, comments, and your name and location to managing editor Tariq Malik at spacephotos@space.com.